Dr. Grossan’s “Whole Person Tinnitus Relief Program” has helped thousands of tinnitus suffers find relief in a practical and natural way. Below is a sample of treatments outlined in the program that have been tested and approved. 1. Count your breath. Count inhale one two three four. 2. Count your exhale one two three four five six. 3. Count in four and out six. It is necessary to actually count those numbers. It is NOT necessary to time the exact time of the inhalation and exhalation. Counting focuses your mind on healing; having your exhale longer than your inhale signals your brain to relax. 5. Mirror feedback: Jaw See the Jaw. See the jaw relax as you use counted breathing. Do not open the jaw; let it fall open as you relax. For TMJ , draw a vertical line in the center of the mirror; practice having the jaw relax in the midline; this cures most TMJ problems. 6. Mirror feedback: shoulders. First raise the shoulders very high. Now on exhale let them fall fully relaxed. Repeat this for a minute or more. 7. Recall when you were fully relaxed and enjoying yourself, before you had tinnitus. Use all five senses plus humor. For example; SEE the ocean, SMELL the ocean, HEAR the music/ocean/voices, FEEL the sand and the warm sun, TASTE the hot dog – recall the mustard. Recall the jokes, humor, and fun. 8. Progressive Relaxation: Lying down, tense then relax your toes, tense and relax your feet. Keep on doing this as you work up to tense and relax your scalp. 9. Finger Method. Raise your index finger. Take three counted breaths. At the end of the third breath, drop your finger and let your entire body relax. The more you practice this, the more effective it becomes and you can do this in any situation, even on stage, or interview. Imagine the finger is an orchestra baton; when you drop your finger, the orchestra/tinnitus stops. 10. The Healing Mind: Imagine you are in a forest. There is a gentle rain that you hear. Otherwise it is quiet and you don’t hear your tinnitus. You see the plants, trees, smell the forest, feel the gentle rain. Here are various sounds of tinnitus. Identify which of the sounds is like your tinnitus. Masking: Play the computer sound comfortably. Does your inner tinnitus sound reduce? Play the outside sound in order to “mask” or reduce your inside sound. Residual Inhibition: Practice playing the outside sound for a minute. Stop. Does your own T sound stop? If so, that is residual inhibition. Practice playing the outside sound for a minute to increase the length of time your inside sound stops. Practice making the inhibition last longer. Nerve Enhancement: Example: The tinnitus is only in the right ear. Play your outside T sound in the normal left ear. Match the volume of your inner T sound in the affected right ear. Now lower the volume of the outside T sound into the left ear; try to match the lowered volume of the outside T in the affected right ear. Gradually keep lowering the volume of the outside T sound and keep trying to match that lowered volume from your left ear. Note: Sounds may take up to 10 seconds to load. I would like to invite you to try my Whole Person Tinnitus Relief Program and start doing something to help your tinnitus. Watch our video for more information. Dr. Grossan’s Tinnitus Caps contains antioxidants that can neutralize and remove products of oxidation, products which can interfere with hearing function. These oxidative products have been found in the brain and ear, and may be associated with hearing problems. 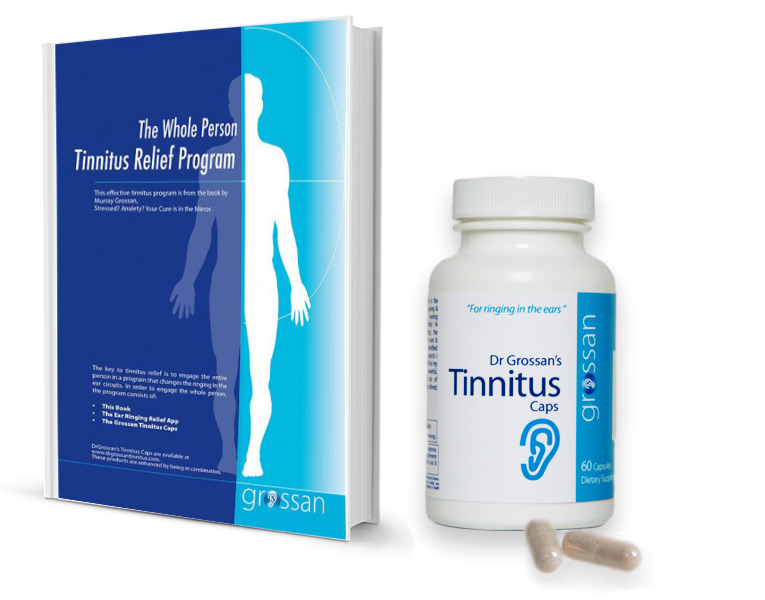 Dr. Grossan’s Tinnitus Caps works by supplying antioxidants for the brain and ear, products for the mitochondria, for circulation, and supplements designed especially for the nerves – a synergistic formula that works in these four ways. Watch Dr. Grossan lead a tinnitus sufferers group. Looking for more support? Join our online Facebook community for tinnitus relief. Members get access to Dr. Grossan and members who are part of The Whole Person Tinnitus Relief Program get premium support. Don’t suffer alone.